My son is getting his first apartment this summer, and I didn’t want him to be hospitalized for food poisoning. Or die from malnutrition. Apparently, he and his roommates feel the same way, so he invited them over for a cooking lesson. It only took a couple of hours for the three 20-year olds to learn to cook chicken, roast potatoes, sauté zucchini and sear salmon to golden-crusted perfection. And along the way, I realized how learning a few key skills can have an enormous effect on the outcome of your cooking. To make tender, juicy, and safe chicken, you need to take its temperature. Otherwise, your chicken is going to chew like sawdust or make you sick. Learn how to sear, and you master the art of getting hundreds of easy dinners on the table in less than 30 minutes. Know how to roast and sauté vegetables so you can cook them stovetop or in the oven, depending on which is more convenient. Here’s the deal. As a nation, we’re eating an average of about 84 pounds of chicken a year. 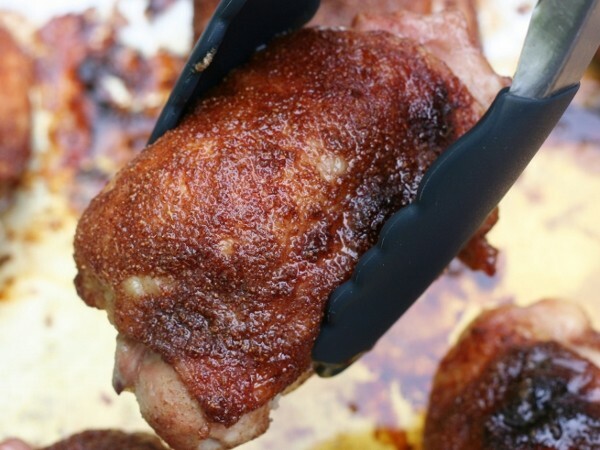 So unless you’re eating every meal out or don’t care if your next bite of chicken bears more resemblance to an old towel than a pleasurable and nourishing food, it’s worth learning the one-minute solution that guarantees your chicken will be moist, tender and safe. Humor me while I tout the virtues of the boneless, skinless chicken breast for just one short paragraph. A simple boneless chicken breast is healthful (low in calories and fat), convenient (cooks in less than 10 minutes) and when prepared properly, appeals to a wide range of palates and eating styles. Dieting? Have a chicken breast. Picky eater? You’ll love the neutral flavor. Don’t want to eat as much red meat? Chicken is your IT food. But only if it’s cooked right. Chicken breasts can go from being moist and succulent to overcooked—meaning dry and flavorless– in a window of less than 5 minutes. But you also can’t err on the side of not cooking chicken long enough: undercooked chicken can make you seriously ill.
You can buy one of these at most house wares stores, like Bed, Bath and Beyond, as well as at many supermarkets and on Amazon . I like Taylor and Oxo brands, both analog or digital. These are not the probes you leave in a roast while it cooks, nor the thermometers with timers attached, nor something that withstands gale force rains. 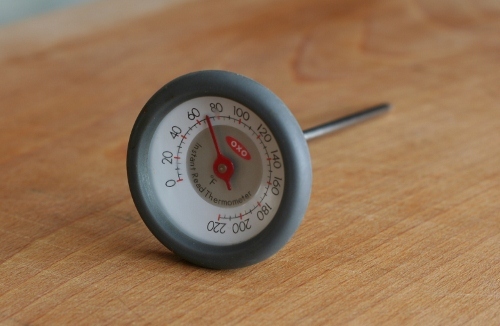 You just need a simple instant read meat thermometer that costs $5-15. Okay, back to the chicken breast. It must be cooked to 160 degrees Fahrenheit. In order to ensure that it is cooked evenly, it has to be an even thickness. Otherwise, by the time the thickest part is cooked to a safe 160F, the thinnest part will be like a hockey puck. To make it even, you need to pound it. The good news about pounding chicken is that it is an ideal way to relieve stress. The better news is that it is fast and easy and doesn’t make a big mess. You can pound 2 pounds of boneless breasts to even thickness in about 5 minutes. First, tear off a 2-foot long piece of plastic wrap and lay about 1 foot on your cutting board. 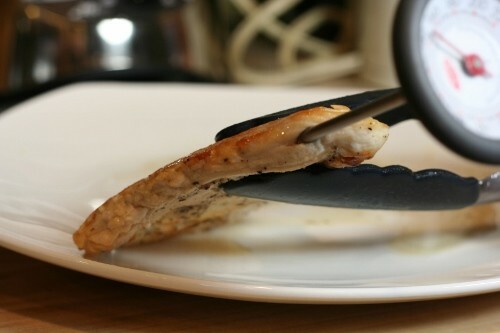 Place a chicken breast, smooth side up in the center of that one foot area of wrap on your board. 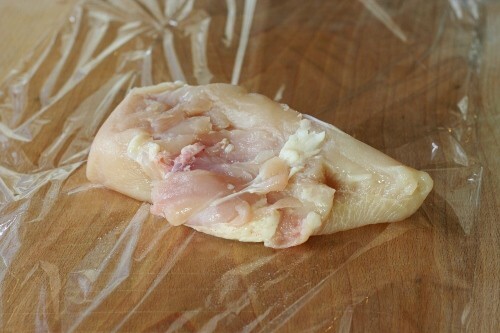 Now fold the rest of the plastic wrap over the breast so the chicken is centered on the wrap and not near the edges or the fold. 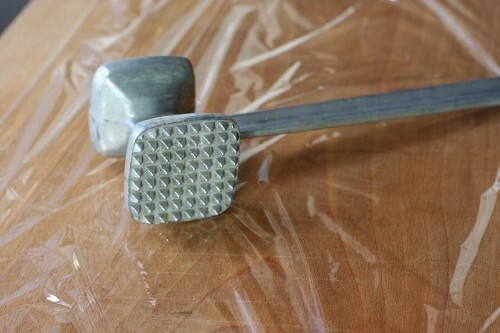 Use the smooth side of your meat pounder (aka mallet), not the side that looks like it has dinosaur scales. (That is for meat tenderizing, which most home cooks don’t do anymore. I think of those as dinosaur scales because they exist for a nearly extinct task). Give the chicken a whack right in the center, even if the center isn’t the thickest part. You are not pounding the breast into submission, as if to say “You will be thin!” When you pound it, the meat spreads out to the sides, which is why you start in the center and work your way out. It sounds more complicated than it is. This process truly only takes a minute or two. Now it’s time to cook. Season the chicken on both sides. For every one pound, use 1/2 teaspoon salt and 1/8 teaspoon black pepper. You can always add more later. Heat 1 tablespoon of olive oil in a 12-inch nonstick skillet over medium high. (You don’t need more oil than that, but I can almost guarantee you are using more. Try measuring it: you’ll save calories and money). Add the chicken breasts, but make sure you don’t crowd them. (If they are too close together, they will steam instead of sear, which means they won’t have that nice golden crust). 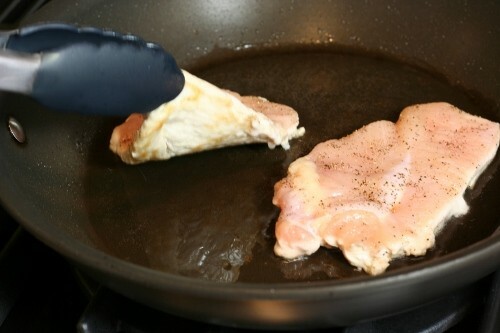 You can usually fit about one pound of chicken breasts in a 12-inch skillet. In this case, I am cooking enough chicken for two people, about 8 ounces total. It will take about 5 minutes for the underside to have this beautiful golden crust– but go by looks, not time. once you turn the breasts over, you will again cook them until they are golden… but now you will know they are ready when they hit 160 degrees. And remember, always, a chicken breast must be cooked to 160 degrees. 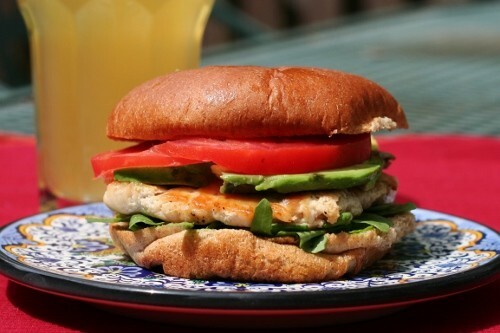 This simple, perfectly cooked chicken breast is juicy enough to make into a sandwich. It doesn’t even need sauce! *Okay, maybe I take food a little too seriously. But if a great meal is not life-changing for you, I hope it is at least mood-altering. And if so, shall we now think of well-prepared fare as a safe and healthy mood-altering substance? You can serve the chicken as is, or perhaps make Chicken in Lemon Butter Sauce. Dredging the chicken lightly in flour gives it a more even, slightly crunchy golden crust, but is not necessary. To avoid gluten, either simply omit the flour or replace it with rice flour. Lay a piece of plastic wrap roughly twice as long as your cutting board over your board, with half laying to one side. 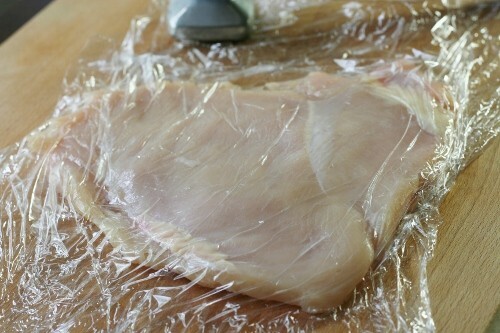 Place a chicken breast half, smooth side facing up, in the center of the board and fold the plastic wrap over it. Using the smooth side of the meat pounder, start in the middle of the chicken and pound in an outward direction until it is an even 1/4-inch thickness. Repeat with the remaining chicken. If you are using flour, combine it on a plate with the salt and pepper; dredge the pounded chicken in the flour, coating it thoroughly and shaking off the excess. If you are not using the flour, season the chicken evenly on both sides with the salt and pepper. I can’t believe how easy you made this. I often overcook or undercook chicken. I can’t wait to try this, since we do eat chicken a few times a week. So thanks! I love this! I also have been teaching my kids to cook: they set up my website so that they didn’t have to call every night and ask how to cook such-and-such. Thanks for the good tips: I still have trouble with chicken. My problem is: I’ll have dinner ready, but my husband (or someone else) might keep saying “Just a minute!” for about 30 minutes —- how do you keep the food warm and juicy???? ?Thanks again. JulieBee, the sad truth for meal procrastinators is that chicken breasts don’t reheat well. Because they have so little fat, they dry out easily if over-cooked or cooked to temperature and then re-heated. And you can’t undercook them in anticipation: they must be cooked all the way to 160F the first time. Chicken thighs, on the other hand, are very well suited to reheating, and are also often delicious served cold. To keep the fat and calories low, remove the skin. To keep the cooking time fast, buy boneless chicken thighs. Here’s what I do to keep perfectly cooked chicken juicy and warm for at least half an hour: get a sheet of heavy duty tinfoil ready, large enough to hold all the chicken flat (not stacked) plus a few inches extra space around the perimeter. Place cooked chicken on the foil while it’s still hot, pour all the juice from the pan on top (I deglaze the pan after removing the chicken to get all the flavor and liquid I can) and fold the foil over the chicken, then crimp to seal. I just leave it sitting on the counter until I need it, up to about ten minutes. If I need longer, I put the whole packet in a warm oven. This method probably ‘cooks’ the chicken a bit longer, but the foil keeps the chicken hot and also gives it time to reabsorb the juices to help keep it moist. Thanks SO much for details and pictures ! Now I feel like I can do the job right ! This is GREAT! So helpful and detailed. I’m a college student and on my own and new at cooking, this was simple and wonderful. Thank you! Thanks for the tips – especially to pound out the chicken! But, isn’t the proper temperature for poultry supposed to be 165 degrees? Brian, you ask a good and very valid question which has somewhat of a long answer. * For many years, the USDA told consumers two different temperatures for two different parts of the chicken. Breasts should be cooked to 160F, they said, and thighs (all dark meat) to 175F. * The recommendation for dark meat is higher not because of safety, but because most of us will prefer the texture (etc.) of dark meat chicken when cooked to about 170-180F. At 160F, dark meat can be a little rubbery/chewy and more pink that most of us find palatable. It is not a safety issue so much as a preference. * More recently, the USDA revised the recommendations. The thinking was that giving consumers one number to remember for the sake of safety is better. So the USDA compromised. White meat will not be as moist and tender– but at 165F it is not yet sawdust. Dark meat will be a little rubbery and more pink than most of us would like. In my mind, it was a compromise that left both results less than optimal. I completely support the USDA’s motivation– it is true that one number is more likely to be remembered than two. But for safe, juicy, tender and ideal chicken, I will always recommend cooking breasts to 160F and thighs to 175F. I’d love to hear what you (all) think… Did the USDA do the right thing? To what temperature will you cook your chicken? I just wanted to say that I am a college student and eat chicken all the time due to workout and need of proteins. I ALWAYS over / undercook my chicken, but I tried this and it was awesome! I’m not a big cook or anything, but you helped me by putting up a simple and easy way to put it together and get it done. Ali, that’s about the best compliment you could have paid me. Thank you! Using huge breasts from Costco, I made a couple of fantastic sandwiches last night following your directions. They were juicy and the wife loved them. Thanks for the simple and clear directions. I’m so glad it helped! Check out the instructions for chicken thighs, too– they are great to make for the holidays, because unlike breasts, they don’t dry out when made in advance and re-heated. Thanks so much for the easy-to-understand instructions. So many times, I have been intimidated by cooking because either a person or book says to SIMPLY cook the chicken, etc. You have done a great job to break this down into bite-sized pieces!!! I tried this today because i looking for the best way to cook chicken breast to use it in a variety of ways. This is it! And it was so easy and quick. My 7 year old loved it! and that says a lot. Thank you so much for posting. I can cook multiple pieces at one time and make different things throughout the week, like chicken salad, chicken sandwiches and pastas! It’s great! It changed how I cooked chicken breast from now on. I am so glad it helped you! Please also check out my post on chicken thighs, as it too may be of use. Finally, a recipe with wonderful directions!!! Thank you so much for the helpful hints and I will definitely try this one. Great details, I will have to try this. Do you have any recipes for baking chicken breast? This is perfect..Thank You so much for explaining and photo’s!! Marge, Can this same process be used for grilling chicken? Absolutely! Pound, grill, and take the temperature. Thank you. I too am a college student on a budget who needs lots of protein due to working out. This will hopefully help me bake chicken correctly in the future so both me and my girlfriend don’t get sick or eat rubber. Ankit, another great form of low fat protein– perfect for someone who works out a lot– is the pork tenderloin. I wonder if this recipe for Pork and Vegetable Stir Fry might be of interest to you. Believe it or not, mussels are also a great source of lean, inexpensive and easy-to-cook protein. Here’s how to cook them. HI Matt– sounds like you are ready for a few more good chicken breast recipes, now that you have the technique down pat. Perhaps Chicken in Lemon Butter Sauce, or this Buffalo Chicken Burger would be good for you to add to your repertoire. Happy cooking! This sounds awesome and I’m going to try it w/ plain chicken breasts, but we have a couple of boneless chicken breasts that are covered in parmesan cheese coating and I’m thinking of baking them… they’re both pretty thick… Can you give me a suggestion on time and temperature to bake them? Hi Jamieson– Chicken breasts should always be cooked to 160F, if that is what you are asking about re temperature. Or, perhaps you are asking about oven temperature, in which case I suggest around 375F, depending on the thickness. Generally, you would want to cook thicker pieces at a more moderate oven temperature to avoid scorching the outside. (At a high temp, it is likely the surface will burn by the time the center is cooked though). Without knowing how thick the cutlets are, I can’t say how long they will take to cook. It could range from 5-10 minutes per side (10 to 20 minutes total cooking time). My suggestion is to check them at after they have cooked 10 minutes. If they are at anything less that 160F, be sure to wash the thermometer in warm soapy water before using it again. Love this! you make it so easy.The pictures really help too. Thanks heaps for this. I have one question for you. I tend to cook chicken on a pan on a gas stove-top (and thus don’t really have a temperature gauge). What tend to happen is the outside burns/charcoals and the inside is still pink (and not 160F). I have pounded them as much as possible, but i feel i may have the temp up too high. Should chicken be cooked on lower heat if this happening. It really does sound like your pan is too hot– that’s what would cause the chicken to char on the outside before it is cooked through. When you heat the oil in the pan, be sure to not let it get to the point where it is smoking. If you place your palm one inch above the center of pan (parallel to the pan surface) and count to four, you will feel the heat in the pad of your hand– but not to the point where it is too hot to hold it there. Also, when you say you have pounded them as much as possible, I’m wondering if you made the chicken too thin. Pound it to make it an even 1/4-inch thickness, not to get it as thin as possible. At least, not for most recipes. I hope this helps and that you have better success. Let me know! It would be fantastic if you had a step by step cook book with pictures. I’m a single guy living alone and eat out because I can’t cook. I would like to cook simple taste meals. What do you suggest I do? Louis, I think one of the best things you can do is to take a couple of basic cooking classes. I teach in the recreational (meaning, not professional) program at the Institute of Culinary Education here in New York City. If you also happen to be in NYC, you can check my calendar (click on the tab at the top of the page). But you needn’t live in NY to find a cooking school– they are all over the country. I made boneless breasts tonight, started in skillet in EVOO and finished in the oven. I did not pound them, 2 8-oz breasts that looked just like your starting picture. I took them out when they read 160, then covered with foil while I finished the rest of the meal (made a quick gravy, got everything else on the table). You could see the meat was moist, but it was oddly dry and we could barely cut/chew them, they were so rubbery. What happened? Sandy, I think that because your chicken breasts were so thick, by the time they reached 160F in the center, the rest of the breast got overcooked, and thus rubbery. In other words, even though at the very center they were cooked to just the right degree of doneness, it took so long to get there the surrounding meat cooked too long. And to address your other concern: while I don’t know how long you let the breasts sit under the foil after they cooked, it doesn’t seem like it was very long, in which case that wouldn’t cause them to dry out. Truly, pounding makes a big difference in the end result. This is perfect! I like that you even put pictures of the incorrect and the correct! This makes THE difference for me! I’m happy you found it, too! Please let me know if you are looking for any other cooking information, and I’ll try to do a post about it. In the meantime, Happy Cooking! Ah this was perfect! The chicken tasted so good and not weird and chewy like my other method. Thanks so much! I am so happy to hear it, thank you for letting me know! Oh, my goodness! I cannot say enough about how moist my chicken came out! It was wonderful! My hubby and girls really, really liked it. It is, by far, the juiciest chicken breasts I have ever cooked. I followed the instructions, as written, and you are right on! I am just so excited! This is a keeper recipe, for sure. I will give this a try. Thanks for the step-by-step and the pix! I dry all the chicken out to the point my kids don’t like it anymore. Looks like I have a solution! Hi, thank you so much for giving so much detail and pictures to explain. I wish every set of instructions did it that way. I have battled with tough chicken for so long. It discourages me from wanting to cook. Now, i am excited to go home tonight and fire some chicken to perfection!!! Yay! Please let me know if you have any questions or concerns– or, for that matter, if they turn out great! Fantastic instructions! I am not a great cook and have begun teaching my daughter some of the basics. This is definetly going to be included in her lessons. This is a great recipe. Thanks for sharing. How would I go about doing this same chicken in the oven? You can certainly bake or roast chicken, but bear in mind that it will not brown the same way. You can brown it and transfer to the oven, or put a spice rub on it…but a simple boneless, skinless chicken breast won’t brown on the outside in the time it takes to bake. You can, however, broil it. Broiling is like upside-down grilling. 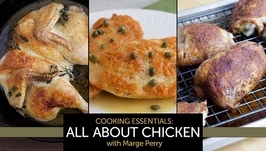 For a slew of chicken recipes, click here . You will find baked, roasted, grilled and sauteed chicken, and chicken breasts, thighs and whole birds. You might especially like this post about roasting chicken thighs. The same can be done with chicken breasts in the oven (although the cooking times will be different). Thanks so much for this! I do believe I have been cooking chicken incorrectly for the past 20 years! I jut made the BEST Chicken Ceasar Salad!! The reason I don’t give directions for baking a pounded breast is that , unless you top the chicken with something, it is not appealing looking– it won’t brown. However, since you and so many others have asked about this, i will post a “work around”– that is, a method for baking pounded breasts that does get an appealing looking exterior. There are a number of ways of doing this: a spice rub, a glaze, or a sauce over the chicken will make it better looking. (We eat with out eyes, too, of course!) I will try to post something in the next week or so. Thank you so much for this! 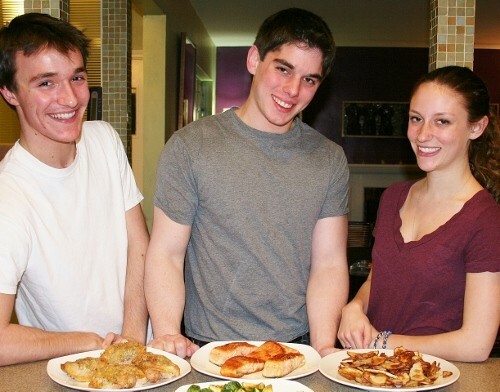 I’m going to try it tonight and against the world’s toughest food critics: MY KIDS! Nicola– When I started dating my husband, my kids were in grade school. He was the chef for a high end caterer (they cooked for the likes of then First Lady Hillary, Clinton, Bette Midler, Elie Weisel, etc)– he was accustomed to cooking under high stress situations. One late afternoon, he was working on a project with me in the kitchen when the kids came down and said they were hungry. We put them off as long as we could, until they were nearing meltdown. And then I watched this man SWEAT trying to get a meal on the table fast enough for two over-hungry, whining kids on the brink of tantrums. It was then I realized that cooking for kids on a daily basis can be much more stressful than putting out fancy meals for hundreds of guests. Hope your kids love the chicken! Thanks for the post. You said these pounded out breasts weren’t good for reheating. does that dry them out? could I unfreeze breasts, pound them out, then refreeze them so they are ready to go? I’m in a mode of trying to think of all the prepare-ahead stuff I can do to make the daily schedule more manageable. You are right– chicken breasts (pounded or not) don’t re-heat well: they dry out because there is so little fat to keep them moist. You can absolutely pound them and then freeze, as you are suggesting. Better yet, when you freeze them (or re-freeze, as the case may be), wrap each breast individually in plastic wrap, and use more plastic wrap then you think you should. The better the barrier between the surface of the chicken and air, the better they keep. You can then place as many of the individually wrapped breasts as you like in a freezer-proof plastic bag. When it comes time to thaw the breasts, you can thaw exactly as many as you need. As a bonus, they will thaw faster when individually wrapped. Place them on a single layer on a plate/platter and thaw over night in the refrigerator. Awesome!!! Thank you so much! In going to give it a try tonight! Great job explaining and you made it super easy! Hi I just want to say that I really appreciate your information especially coming from a black community where we tend to over cook food. I have been cooking chicken breast under the wrong direction for years, and come to think of it I don’t remember ever really learning how to properly cook chicken breast, I definitely have gotten fried and baked dark meat down to the t, lol but I can’t wait to try this out! 1) How to cook chicken tenderloins? My family prefer them over the whole breasts. 2) How do you know that the pieces, which are even smaller that tenderloins, are cooked to the right temperature? 3) Does marinading help to make chicken tender and jucier? Thank you so much for all the work you do and for sharing with us! 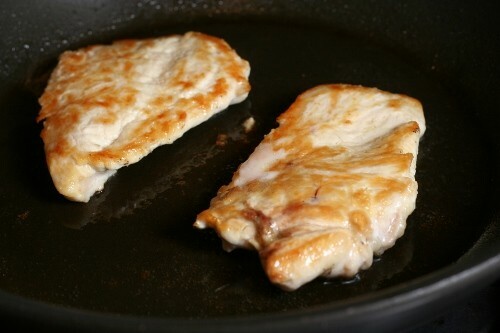 Chicken tenderloins– or any smaller pieces of chicken breast–are usually used for stir-frys, stews and kebabs. You can also bread them to make “Chicken fingers” which can be sauteed, fried or baked. If I understand your question #2, you are cutting the tenderloins into even smaller pieces, is that right? It is very hard to accurately take the temperature of, say, 1-inch pieces, because the thermometer wand doesn’t have enough area to read and register the temperature. So when cooking small pieces of chicken, you do need to rely more on time and feel. By feel, i mean that when you press a piece of chicken with your fingertip, you want it to feel fairly firm. The squishier it is, the less cooked. Whole tenderloins, on the other hand, tend to be about 2-inches long, which means you can take the temperature lengthwise. Your marinating question is a really good one, too. (You ask three good questions here!). When you marinate chicken for a relatively short time (under an hour), unless that marinade has lots of acid in it (lemon, wine, etc), chances are it is just flavoring the surface of the chicken. Marinating chicken for longer in a very acidic mixture (and/or with a lot of salt) can help break down the protein, which can make it more tender– but also somewhat mealy. Marinating will not make chicken juicier– that is really all about cooking time and temperature. Thank you very much, Marge! You answered all my questions. By the way I love your web-site. It is awesome! Thank you for all the hard work you do! This seems like an easy approach, my husband often complains about my cooking when it comes to chicken. I dont have a thermometer though, is there any other way to determine the chicken is not overcooked? thanks. Marie– There is nothing as accurate or reliable as a good old fashioned instant read meat thermometer. It is truly the best way to ensure you cook your chicken to moist, tender, juicy perfection– no more and no less. They are quite inexpensive and readily available at any Bed Bath and Beyond as well as many other housewares stores– and many grocery stores carry them, too. I learned from my great grandmother that if u want nice and moist chicken breast or even roast chicken put some mayonnaise on it or even better to marinate ur chicken with plenty of mayo.doesnt taste any different so u can put all the spices and add on’s without ruining the taste.absolute winner! Wow – thank you they were perfect! I wish you a lifetime ahead of great happiness and wonderful meals together. This is FANTASTIC! As a newlywed trying to feed an athlete-husband who eats a full meal every two hours, I’m reading everything I can find on cooking – especially for cooking meat. And I can’t ever seem to make chicken “right”. I always err on the side of caution and wind up with chicken that’s too tough and dry. Thankfully my man will eat absolutely anything (seriously), so he doesn’t mind my trial-and-error cooking, but I hate not knowing how to fix my mistakes. I’ve searched high and low for instructions on making chicken and this has to be the most straightforward description I’ve found. Can’t wait to try it! I won’t tell you my age, I’m too embarrassed. Let’s just say I never learned the basics of cooking, I started by learning gourmet cooking! Now that I’m much older I don’t want to spend all day in the kitchen but I still want food that tastes good to eat. You’ve encouraged me to give it a shot! Good thing too as I was starting to waste away. Plus processed dinners don’t do anything to perk up my appetite. In fact they almost destroyed it. I look forward to reading more recipes on your site. Oh! I just saw that you have a recipe for Quinoa. Hooray! I bought a bag of it about 6 months ago and have yet to open it. I love quinoa! I hope you find at least one of the recipes I have here that you will also love. And I am happy to be of help on “the basics”– but you should know you are not alone. Many people seem to learn complex recipes without learning some of the basics…I teach cooking to home cooks and actually see this a lot. So…Happy Cooking! It worked! The chicken was excellent. And just as important, it really was quick and easy because you wrote out all the important details that other recipe writers miss. I feel like I did something nice for myself. I’ve been missing good tasting food for too long. I’m so glad that your working on a cookbook. Until then you can bet I’ll be using this site again. Thank you! I am going to try this tonight. Also, I REALLY appreciate your humor! I hope you’ll share how it turned out, Melissa. Happy cooking! It was absolutely perfect! Delicious and juicy. I will always use this method. Thanks for breaking it down the way you did. Hi Marge, I’m glad your post has helped so many people! I’ve found that the trick for cooking thick chicken is a two-step process — first sear it to the golden color in your pictures, then put it into a 250 F degree oven until the breast reaches 160. Let rest with a loose “tent” of foil over the plate for 10 minutes to finish cooking them. The internal temp will rise to 160 eventually. There’s so much variation with size, it’s hard to say how long to bake at 250 F. I’ve found if I checked back after 20 minutes, take a temperature reading, I can guesstimate see how long I am from done. The result are breasts that are both THICK and juicy, which is something quite different than eating a 1/4″ cut. It’s also important to know if your oven temperature is off. I’d suggest buying a separate oven thermometer to put near your baking dish so that your breasts are actually being exposed to 250 F.
Wonderful tutorial. Thank you! I’m 29 and sick to death of dry chicken, so I googled for help. Simple, practical, and wonderful. I can’t wait to give it a try tomorrow night! @Marge hello you check the temp after cooking the chicken, so how would i know if the temp has reached 160F while it in the skillet. do you check the temp regularly while cooking it. looking forward for your reply. Chadee– That is a great question. You check the temperature around the time when the recipe says it should be done…times in recipes are guidelines, but temperature is an absolute. So, if a recipe says “about 5 minutes per side, or until golden and cooked to 160 degrees” the time, of 5 minutes per side, is about when you would check the temperature. Or, if the chicken looks golden in less time (maybe your pan conducts heat faster, or maybe your stove was hotter), test the temperature earlier. 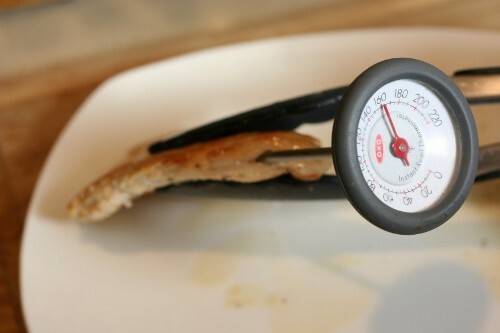 Remember that if you check the temperature before it is at a safe 160 degrees, you must wash the thermometer in warm soapy water before sticking it back in the chicken. I have cooked chicken before and let’s just say, it wasn’t very good. Saw a commercial for Land O Lakes Saute Express and decided I wanted to try again. SOOOO glad I came across your post! I followed your instructions to a T and used the Saute Express garlic & herb and let me just say…OH MY GOD! I would have paid $30 for the dish I made in any given restaurant! (paired it with some green beans and a baked potato) The chicken was so juicy and tender yet still had the beautiful golden brown crust. I even went to BB&B and got the exact OXO thermometer ($11.99, very reasonable) you show on here….THANK GOD for that, it certainly got the job done! But like your advice says, go by looks for the brown, not necessarily the time, worked perfectly. Even though I slightly overcooked (about 170-175 degrees using my awesome new thermometer) still turned out perfect. The dishes are still in the sink waiting to be cleaned and the wonderful smell is still lingering in my house, but I just HAD to comment ASAP! THANK YOU, THANK YOU, this will be a staple for me no doubt! 1/4 inch after pounding, roughly 5 minutes per side, amazing!!! Adam– I am so glad this helped! Now that you have mastered the chicken breast, you may be ready to try chicken thighs (even easier!). Happy cooking! Just tried this recipe, followed it to a T, and the chicken came out delicious! Came out to exactly 165 degrees, and it was nice and juicy. I love to cook, but I find that I often end up with not-so-tender chicken. I generally bake it, without flattening it, so after reading your article, I’m thinking that the uneveness (is that a word?) can cause my variance in success. I also had no idea how to take the temperature, to actually do it lengthwise! Is there some secret to this? Also, if I cook several chicken breasts at the same time, do I need to take the temperature on each, or is one sufficient? Food temperature continues to rise after you take it off the heat (for about 5 minutes, depending on what it is). When you are watching the achingly slow rising, you are watching it in real time, as the temp goes up. In a word: fuggetaboutit. Once the rise slows to a crawl, you’ve learned what you need to know. Take the temperature of the fattest breast; if that is cooked to a safe temperature, the others will be, too. If one of them some how seems less done (perhaps the pan wasn’t centered on the heat, for example) take the temp of that one, too. But no, you needn’t take the temperature of every piece of chicken in the pan. Thanks SO much for this information! I am newly married and had no clue how to make something as simple as a chicken breast! 🙂 the first time I tried this it was a success, and every time after too!! Love all the pictures you included, I am a big visual learner! This sounds dorky, but this has made me excited about cooking! Thanks Marge!! The instructions are so clear and helpful.. thanks.. I do have 2 questions, however, my husband is very picky when it comes to food. I made tandoori chicken, with chicken breats and followed the instructions as said on an another website. they taste fine and all but the chicken when cooked dried out, it wasn’t at all soft and tender, the steps you mentioned, are they to be followed for marinated chicken as well? Another question. When ever I cook chicken with the on shelf sauces, the chicken again dries out. No matter how closely i follow the instructions, and with the sauces, the taste does not actually go into the chicken, no matter what i try with it, the chicken does not catch the taste of the sauce inside. Will help alot if you can give me some instructions on these questions. I am afraid this question slipped through the cracks (of my mind!) and I never answered you– my apologies! Re: tandoori chicken. The important thing, with any recipe, is to cook the chicken only to the safe internal temperature and not beyond. If the chicken was dry, I am fairly certain it cooked too long. Time, in any non-baking recipe, should be a guideline, not an absolute. Use the temperature of the food and visual cues in the recipe (such as “until golden”, “until the water is absorbed”, etc) will be the more accurate way to measure doneness. Think about it: your oven, your stove and your pots and pans won’t conduct heat exact the same as the ones used by the developer and tester of the recipe. But the visual cues and temperature tell you what should happen to the food. Of course, that also explains how to get chicken properly cooked when using shelf sauces. Again, let temperature be your guide. Re: Chicken not “catching” the flavor of the sauce inside. That is 100% true. The flavor won’t permeate all the way through the meat. A marinade may affect texture, and aid in flavor, but the flavor of the marinade will not get to the center of the chicken. It will flavor the outermost surface and perhaps a little way into the meat, but that’s it. And that should be enough to make your dish taste great. 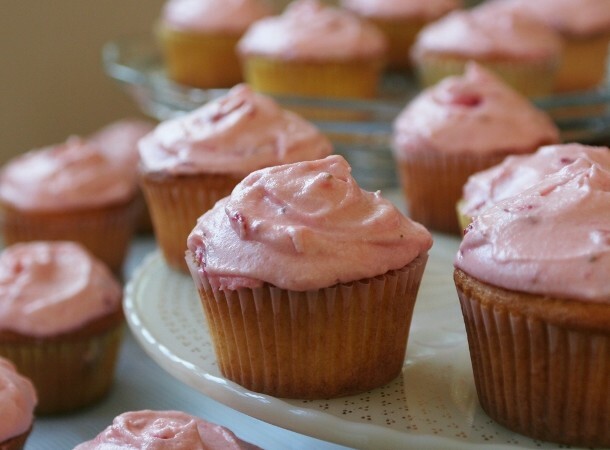 Think of it like icing on a cake: every bite has a little icing with the cake, but the icing is a companion flavor (and texture), and doesn’t permeate through the nice crumb of the cake itself. Does that make sense? I had some questions regarding your cooking oil. What kind of olive oil do you use to cook chicken, or for more heat-intensive recipes like stir-fry? Or for frying vegetables? I heard that extra light olive oil has a much higher smoking point (at 468 degrees F) than extra virgin olive oil. Would you know the difference between extra light olive oil, virgin olive oil and extra virgin olive oil? Maybe the process they use to make them? Are some healthier than others? To the best of my knowledge, extra light cooking oil has less “olive oil” flavor than regular olive oil– and is marketed for people who don’t want olive oil flavor. But you aren’t getting much flavor from the 1 tablespoon you use as a cooking medium (to keep the food from sticking), so there is no need to buy yet another kind of oil. Extra virgin olive oil, on the other hand, is made from the first pressing of the olives. It has more of certain important nutrients (polyphenols) still available, and– more importantly!– it tastes wonderful. But it is more expensive, and not necessary to use as a cooking medium. Save it for dressings and sauces, where you will taste it. I also use canola oil for cooking. Both canola and (regular) olive oil have a smoke point that is suitable for nearly all my home cooking. When it comes to choosing oil for cooking, a top researcher from Penn State told me the healthiest thing you can do is use a mix of oils. Olive, canola, peanut, sesame– there are many oils and all have different nutritional profiles. This is hilarious!! Not the actual instructions, the little comments along the way, really made me laugh (especially the bit about pounding it thin!). Excellent article. I’m looking forward to hearing how it turned out! Absolutely! Everything is the same…pounding, taking the temperature, etc. The temperature is key to having the chicken turn out moist and tender. i’m trying to start a diet anchored mainly on chicken breasts. i’ve been cooking and eating the tough-on-the-outside, saw-dust-on-the-inside variety for around 2 weeks now. i’m going to try your tips. i’m pretty excited. thank you! also, please allow me say that your article (?) was very reader-friendly. concise where it needs to be and detailed where it needs to be. Hi, Thanks for the chicken breast tutorial. I am not new to cooking and have been feeding a family for years, but I have always had trouble with chicken breasts. I left them the way they were and would bake them or cover them with a sauce and they never turned out to my liking. I tried chicken cutlets and they always turned out better because they are thinner and an even thickness, so I tried pounding the breasts to make them thinner like a cutlet, but I used both sides of my mallet. Side one to pound and side two to tenderize, which I thought might help the tough chicken but it still didn’t turn out. So I searched the web asking the question how to cook chicken breasts and came across your post. I tried it and the chicken was moist, tender and cooked to a safe 160F. Thank you. Debra– Thanks so much for your note! I was just feeling like I didn’t know how I could squeeze time to do another post this week, and you’ve inspired me. Your comment really makes me feel like it is worth finding the time– so thank you! I just came across this post after googling “how to cook a chicken breast” and I’m so impressed with your teaching skills! This is so very helpful and thorough. Your kids (and their roommates) are lucky to have you! Thanks so much for taking the time to explain it all so well. Wow! I hate dry chicken, and have always wondered what the trick was when I had juicy chicken at restaurants. My chicken is always so dry! I am now excited to add this to my list of skills. Thanks so much! THANK YOU SO MUCH for this highly informative and concise method on cooking chicken breast! Oh my goodness, I have NEVER gotten chicken breast to be moist until I tried your method! If you published a book for College Student Dorm Cooking 101, I would SO buy it! Great explanation and love the photos but you didn’t say what to do if the thermometer only reaches, say, 150. Then what? Put it back in the pan? For how long? Then it will be leather. Kathy– It won’t be leather if you put it back in the pan only until it reaches 160F. The key is cooking it to the right temp– it won’t be tough if you take it out long enough to take the temperature and put it back in. Thanks this turned out awesome. You were right it was so good just plain I didn’t want to mix it with the other ingredients. Thank you for putting this post together. This was an excellent tutorial!!! Thank you sooooooo much!!!! Amazing!! This is seriously the best chicken I’ve ever had. We like to make a mixture of salt, garlic powder, a little pepper and lots of chopped herbs from our garden (basil, sage & thyme) then spoon it over the chicken before cooking it. Absolute heaven! Thanks so much! What temp to I put he stove on? Medium? Hi Robin– You will see in step #3 I say medium high, but really, you want to heat YOUR pan to medium high, and what matters more than the knob on your stove is the heat in your pan, which is what cooks the food. While it is not scientific, a great way to tell when your pan is medium high is to put your palm flat over the center and count to 4. At that point, you will feel heat in the fleshy pad of your hand– the part just below your fingers. It doesn’t matter what your fingertips feel– concentrate on the pad. That is more accrate because it shows you the heat in your pan, not on your stovetop. I am always happy to see a 16 year old cooking– and especially cooking nutritious food. Kudos to you, Jimmy K! What to do if you do not have a meat pounder? I made this recipe and for the first time, enjoyed my boneless, skinless chicken breast! I tried it a second time with a breast that had been frozen and I had totally different results. First of all, I could not get the breast to flatten with pounding even though it was thoroughly defrosted. And it would not brown, it steamed as it was leaking juices. I assume the freezing process alters the cellular structure, Big disappointment. Do you have any tips with working with defrosted product? Marcie, I am so sorry to hear how wrong this went for you with the frozen breast! But I have used thawed breasts a gazillion times, and I promise you– really and truly PROMISE– that if the breast is thoroughly defrosted, it will work exactly the same way. Here’s what I think/posture/guess happened: the chicken breasts you used were thawed on the outside, but not through to the very center. It can be so deceptive! You touch it, and the surface is not frozen, and you think it is fine– but inside, the “core” is frozen. That would explain everything that happened to you: the excess moisture, the inability to pound. To tell if a chicken breast is frozen in the center when thawed on the exterior, you can do a couple of things: A thermometer will show you if there is a big temperature difference– but also, when you poke the stem in, you will feel additional resistance if the center is frozen. Also, if you simply lift the breast up and sort of bend it, you will be able to tell if the center is more firm than the rest. I hope this helps– please keep me posted! Thanks for these great tips. I just made chicken sandwiches by following your instructions and they came out perfect! I usually eat only dark meat because I find white meat to be too dry. But now I’m pregnant and want to eat as healthy as possible. I’ve attempted to cook chicken breasts before but always ended up with dry meat. Your instructions were great and they came out perfectly juicy. Thanks so much! I’m so glad, Sarah! Stay healthy and strong– and keep cooking! I am SO glad I found this today! I made chicken breast in the oven last night for dinner but it turned out dry and flavorless. I am married but feel like my cooking is nowhere near where it should be. Thank you so much for these easy to follow instructions and pictures! I can’t wait to try this out tomorrow when I make more chicken breast! And might I say, that chicken sandwich looks quite delicious! But I may be moving too fast here– your enthusiasm is infectious. For now, I would be very happy to hear how your breasts turn out…please let me know. This was great info! Thanks for sharing!! I dont know if you answer this before but i wanted to know that if i make my chicken at night and pack some for next day lunch, will it get dry when i reheat it? The sad truth is that chicken breasts do not re-heat well. They have very little fat, so when you re-heat them, they tend to dry out. However, you could make chicken breasts the night before and put them in a sandwich with mayo, mustard or some other kind of “wet” condiment, and that would make them much more pleasant. (They will still be drier, but the wet sauce will make it not seem that way). You can also reheat chicken breasts when cooked in liquid, such as in a stew, better than if they are simply cooked whole on their own. Anytime they are in or served with wet or liquid ingredients, they will be more palatable. I usually only bake or grill chicken. I seared per your instructions and the breasts came out perfectly. Thanks! Yay! Thanks so much for letting me know– I love hearing about cooking success! Thank you so much for this beautiful step by step directions for perfect chicken, I love the thermal trick through the side of the chicken. 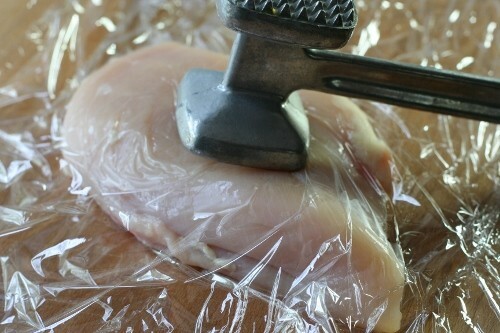 Don’t eat plastic wrap by pounding like this.. Plastic wrap is bad for health! You won’t be “eating” the plastic wrap at all. You simply lay the wrap over the chicken and remove it after you have pounded it. It is similar to wrapping chicken in plastic wrap to store it– you discard the plastic after it’s job is done. Thank You! Until I discovered the I tried many different methods but always came out with Dry chicken that needed a sauce, and I don’t like sauces on meat. This is perfect every time! I didn’t know about the temperature taking. I sear chicken on both sides for a little longer than a minute. After the two minutes are up, I start lightly tapping the pieces with a metal spoon/fork whatever. Right after the two sides have been seared, the meat looks a little puffy than when raw, and the fork/spoon bounces away more easily. As you keep on tapping the meat (excuse me- no pun intended), the chicken will start to slowly lose the bounce. When it starts to lose the bounce is when you stop. No thermometer necessary, no need to pound your stress out on the chicken either! Omg! I am 55 years old and now thanks to you, I finally know how to make good chicken!!!! Thank you! Which goes to show we young ‘uns can still learn plenty! Thanks for this valuable info. We eat a lot of chicken and I have been dissatisfied with how dry it turns out. Your instructions are excellent! Any tips on frozen chicken? Thank you for the easy instructions and proper way to cook chicken. If you are making a chicken soup or chicken casserole, how do you keep the chicken breast moist? 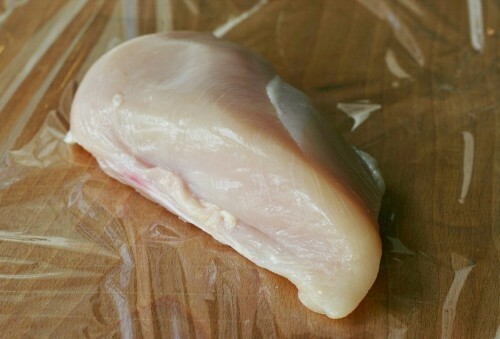 When making soup with chicken breasts, a key is to not boil the breast meat. Cook it gently, and not for too long. Also, if you will be reheating the soup, cut the chicken into small enough pieces (about 1/2-1 inch) so that they do not require a great deal of chewing, which helps them seem less dry. The same ideas apply to casseroles: try not to heat the chicken too vigorously, which toughens it, and eep the pieces fairly small. Thank you for sharing. You took the time to explain thoroughly and I really appreciate it,I’m sure others do too.Is it important to start off with a really heated pan? Donna, it is really important for the pan to be hot when you put the chicken in– that’s how you get a nice golden sear without overcooking the chicken. And FYI, this does not only apply to chicken, but to any protein you want to sear… Happy cooking! Well some how I still managed to mess up my chicken even following this recipe.. I’m not a good cook at all, lol.. My chicken had a very crispy skin, but the inside was at least decent.. I wonder if I just cooked it on to hot of a temperature? It does sound as if your temperature was too high…I assume you used a thermometer to measure the internal temp, and cooked it until it was just at 160 in the thickest part. If at that point the skin was too crisped (meaning dark brown) then that’s what the issue was. Don’t give up! Just follow the directions, and give it another try. Second time’s a charm! 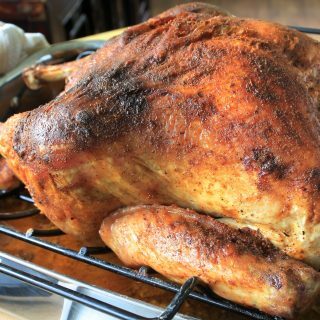 Someone else may have already mentioned this, but chicken is safe to eat if it was cooked at temps lower than 160 F as long as it was held at that temp for a long enough time. http://www.fsis.usda.gov/wps/wcm/connect/9ab2e062-7ac8-49b7-aea1-f070048a113a/RTE_Poultry_Tables.pdf?MOD=AJPERES (go to page 4). I only ever cooked chicken all the way to 160 F once, and that was when I was cooking for my in laws (who are American) and my mother in law got paranoid and took out a themometer (I’ve NEVER cooked with a themometer in my life lol). One of my favourite chicken recipes came out horribly dry, derp. I don’t actually know anyone here in Australia who cooks with a themometer. Even in cooking class at school we never used one. Maybe it’s a cultural thing? Actually, I believe the difference is not cultural as much as it is about the chicken you have access to in Australia as opposed to our chicken. I also looked at the very interesting link you sent, and would say that it is geared to the ability to measure the amount of salmonella (only). IN the absence of that ability,I am a little concerned…but I am truly intrigued by the link you sent and will look into it more closely. Thank you! If you wanted to get a truly comprehensive chart you would need to look at all the thermal death time curves for each bacteria. Each bacteria will die at slightly different temps, and each bacteria has different population levels at which they are safe to consume. Point is, it’s not *always* unsafe to eat food that hasn’t been heated to the temp at which all bacteria are dead within seconds. 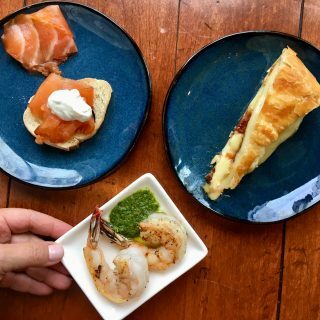 Food safety is always a function of temperature AND time – which is why sous-vide recipes have been around for a couple hundred years and food can be pasteurised at lower temps than you would expect – as low as 135 F (which is actually in the ‘danger zone’ lmao) – but cooked for hours and hours. Can you use this method to grill effectively also? I believe that the safe minimum internal temperature for cooked chicken is 165F and not 160F. See http://www.fsis.usda.gov/wps/wcm/connect/625d9435-4f14-46fe-b207-5d6688cb... for reference. Hi Tom– The USDA changed their recommendation for the safe internal temperature of chicken breast from 160F to 165F several years ago, and here’s why. It used to be that there was one temperature given for chicken breasts of 160f and another given for chicken thighs of 175F. The USDA felt that consumers were better off needing to remember only one number, and 165F was the compromise. (I interviewed some one from the USDA when the change was made). In fact, chicken thighs are safe but less palatable (or pleasing to the palate to most of us, I should say) below 175F– the old USDA recommendation took into account both safety and consumer preference. And chicken breasts are safe above 160F. So you can safely use 165F if you prefer, but I believe the older guidelines, which were just as safe, result in more pleasurable food. help!!! Otherwise the garbage man gets them!! WHile you can’t exactly get moisture back in, you can make that chicken seem more moist– and quite tasty– by shredding it or cutting it in small pieces, simmering it gently in more sauce, and treating it like “pulled chicken” and serving it on slider or hamburger rolls. Enjoy! Man oh man. I should have read this first. Plastic wrap around my meat. Brilliant. Instead I have chicken particles everywhere. Sue me. I’m a single dude. I don’t cook often. When I do it’s easy stuff. Like burritos or raman. …mmmmm, raman. So which one to be considered? THANK YOU for all the detail! I read other recipes and they leave stuff off. I’m gonna try this! 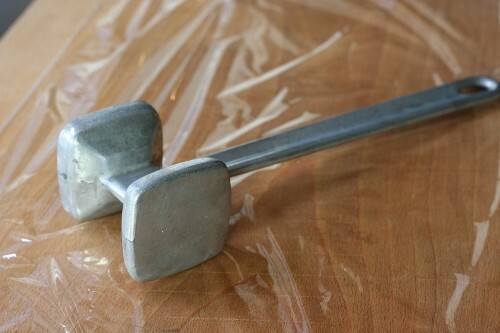 I don’t have a meat pounder so I’m off to using a stone hammer. Let’s see how it goes. A wine bottle works well, as will a rolling pin. Good luck! Thank you for instructions and a simple recipe that led to my finicky, vegetarian wanna-be daughter to proclaim, “I love this! Can I please have this in my lunch every day?” I was speechless. Truly. So simple and good. Thank you! I’m a wife/mom, and husband has ALWAYS done all cooking. At 40 years old, I don’t feel comfortable cooking any meat (unless Crock-Pot.) I’ve no experience. I’m grateful for your thorough and simple instruction, and I will be making dinner tonight! Feeling excited and confident! If the chicken is to be stuffed, would you still pound it thin? I made spinach cream cheese stuffed breasts and they were disappointingly dry and tough. You will need to pound the chicken in order to be able to roll it around a filling. The key is to not overcook it! THANK YOU SO MUCH for these tips. You have saved me from eating dry chicken for the rest of my life!! I am so excited! I can’t wait to hear how it turns out! Happy cooking!